The damage to the interior of Sovereign House, in Queensway, Leamington. to a Leamington office building, sparking calls from its owner for more to be done to stop such incidents from happening. An unauthorised encampment of about 15 caravans and additional vehicles was set up in the car park of Sovereign House in Queensway after the gates were forced open. And in the time during which the group were on the site they smashed windows and ripped out anything of value - in particular metal which could be sold for scrap. The site was broken into last weekend and human faeces were also found in the building which has been empty and available to let since September. A spokesman for the site thinks that the level of damage caused to the building, most recently occupied by Geotech Ltd, is so severe that it might need to be demolished. 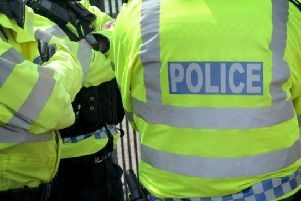 They also had to spend thousands to call out bailiffs to remove the group from the site with police officers attending to observe the eviction, which took place on Monday. The spokesman said that the owner has now had to have the gas, water and electricity cut off from the building and has had it secured - again at great expense. The spokesman, who wished to remain anonymous, said: “It’s almost as if they did it maliciously like they had something against us. About half of the building needs a new roof and the other half could need to be demolished. “It’s absolutely disgusting and if you went in there you wouldn’t believe what’s been done - the smell is awful too. “There needs to be a more concentrated effort for something to be done to stop this kind of thing happening again. *** Home Secretary Sajid Javid has set out draft measures to make it easier for police to remove unauthorised traveller camps from land. He will also consider making it a criminal offence to set up such camps. It is currently defined as trespassing - a civil matter. The Government has announced it will provide authorities with support to handle unauthorised encampments.